New Inventory has been posted on our Facebook page. Check out the new items! Sea Dwellers and Friends offers an aquarium maintenance service for both commercial and residential aquariums. Services are offered on a weekly, semi-monthly, monthly, and six-week basis. Some clients call us “as needed”. Scheduled clients receive priority over “as needed” but we can usually work “as needed” clients in within 2 weeks. The maintenance fee is determined by a number of factors such as distance from Angola, size of aquarium, type of aquarium, frequency of cleaning, etc. Supplies like salt, filter cartridges, fish food, etc., are not included in the maintenance fee. Our retail store is closed. We are expanding our aquarium services portion of our company. We offer: aquarium maintenance, aquarium consulting, trouble shooting, lobster tank maintenance, MARS system maintenance, and aquarium vacation services. 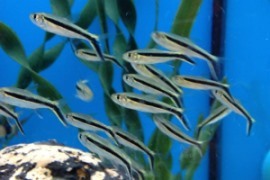 We also provide aquarium supplies and frozen fish foods. We are available by appointment only.